Jesus gave us a pattern to teach us to pray, and that prayer is the Our Father. To sanctify means recognizing the primacy of God in our lives. Jesus, our Master, said: "Father, I have manifested thy name to the men, not with words, but with my life because I have always obeyed your will.". This should be our inner disposition in prayer to sanctify the Name of the Father. In the preaching of Jesus was a constant reminder of God's kingdom: "the kingdom of God is the same as ... the kingdom of God is like ... the kingdom of God is among you …" And again: "Repent and believe in the gospel. " From his words, we can understand that the kingdom of God among men is Jesus. And to achieve this truth, it is necessary the radiant presence of Jesus in our hearts and then, follow his footsteps and mold us as a model. The gospel must also inspire our actions and our thoughts, only then can realize the kingdom of God and praise His name, otherwise, do not sanctify the name of God but sanctify our name. To sanctify the name of God and bringing his kingdom there is only one necessary condition: to live according to the will of God. In fact, Jesus said: "Whoever wants to follow me must deny himself". And again: "I do not seek my own will but the will of Him who sent me." With these sublime teachings we understand that we must try to subdue at all times our will to the will of Jesus. It is a decision-making act that triggers an intimate labor, but through this suffering we become prayerful beings, because we seek the praise of God, we submit to him, we give ourselves to him. This is the prayer that the Lord wants, not only words, but an act inspired by Jesus and His Gospel. It is the relationship with the necessities of our lives. Jesus taught us: "Do not worry about what you will eat, drink, get dress ... for your Father knows what you need before you ask him." What means, do not, grieve for anything you need to live in this world. Father help us to trust you in our day, set us free from the temptation of tomorrow, give us the certainty, not the material certainty, that you will always be present and give us what we need today. 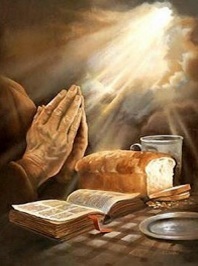 Yes, we must learn to abandon ourselves with confidence to the action of God, for He is ready to give us the necessary. It is challenging the trust, as is the abandonment, but without the presence of God, man loses all hope. This is a terrible thing. Jesus tells us: "if you forgive men their trespasses your Father in heaven will forgive you too." This is the kind of human relationship to be established, forgive to be forgiven. Forgiveness, it is the real essence of God. And God is love, and only love can communicate the vital force of life, because we have to be constantly living. Forgiveness means that God gives you a gift, and this gift is the breath of life not only for you to live on earth, but also in eternal life. It does not respond to evil with evil, but with forgiveness. And forgive, for man, not simply to make peace, but rejecting the death to design life. To forgive is to communicate the strength of God, who is love. Love your enemy does not mean to love the man, but adapt your behavior in front of the man, as Jesus taught. Jesus knows who starts out on the spiritual path, the Devil will come to him and therefore, the believer must build a structure able to resist the temptation, and the temptation is resisted with the Spirit of Truth, who gives us the gift of discernment. Therefore do not fall into temptation, means He gives us discernment, and through the Spirit to know how to distinguish what is in accordance with His will than the temptation from the devil. Jesus would never have spoken evil, evil would have said. So, deliver us from evil means, give us the strength to push him away. To conclude we can say that we must do the will of God, we must seek his kingdom, we must sanctify his name, we must left from the Devil, we must be confident of their daily bread, we must know how to forgive, because through this prayerful style we can say with our life, as Jesus said: Satan go away. This is the true way of praying, this is the inner struggle, this is the famous secret, the famous room in which you have to close because we have to be just you and the Father, then the prayer is simply your state, your being prayerful person. Man needs of Jesus and his Gospel because He is the Lamb of God who takes away the sin of the world, freeing all those who are under the yoke of Satan.